Long time no baking post already, yes? So here's one. Oh, before that, I'm not a good baker, but I do know how to bake a little. I started baking about a year ago, since I found out I have a secret admirer and he said he admired me because I look like the perfect girl who is fast+efficient+effective in her work, knows how to cook, bake, yada yada. 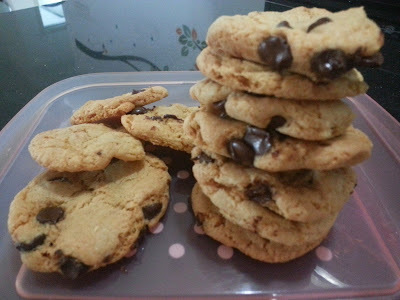 So yes, I baked some chocolate chip cookies (without butter) last weekend. I have everything, except butter, and I didn't bother getting a block of butter from the nearest mini-mart, so I had to make do without the butter. Ingredients: 1.5 cup self-raising flour (I only have self-raising flour at home), 1/4 cup brown sugar, 1/4 cup white sugar, 1/2 cup cooking oil, pinch of salt and 1 egg. Supposed to add some vanilla essence but I didn't have any. I mixed everything using my hands, yep, my hands. No spoon, no fork, no whisk. Just my hands. Added a cup of semi-sweet (Hershey's) chocolate chips. Here's what I discovered. I don't like working WITHOUT butter. It makes the dough firm and sticky. Very sticky. It was very hard trying to roll them into balls using my palm. As you can see, the first row, yep, I rolled with my hands. But after that, errr, I just scooped with the spoon. Even with the spoon, it wasn't easy. Anyway, here's the end result after about 10 minutes resting outside the oven. I tasted a piece. It was good. Crispy, crunchy and a little chewy at the center. One word - Gooooooooooooooood! These were made without butter but there were LOTS of chocolate chips inside the cookie, so I'm not complaining. No doubt, it would be more fragrant with butter. But without the butter, it's STILL very very good. Really. G had a piece. He kept tailing me from the moment I made the dough until I got the cookies out from the oven. I gave him the one with the least chocolate chips. Heaty for babies. Oh yes, G is wearing a pink romper. Mum says I treat him like a girl. butterless cookies?? call me jakun but I've only heard of people specifically mention butter cookies rather than butterless cookies, haha!! 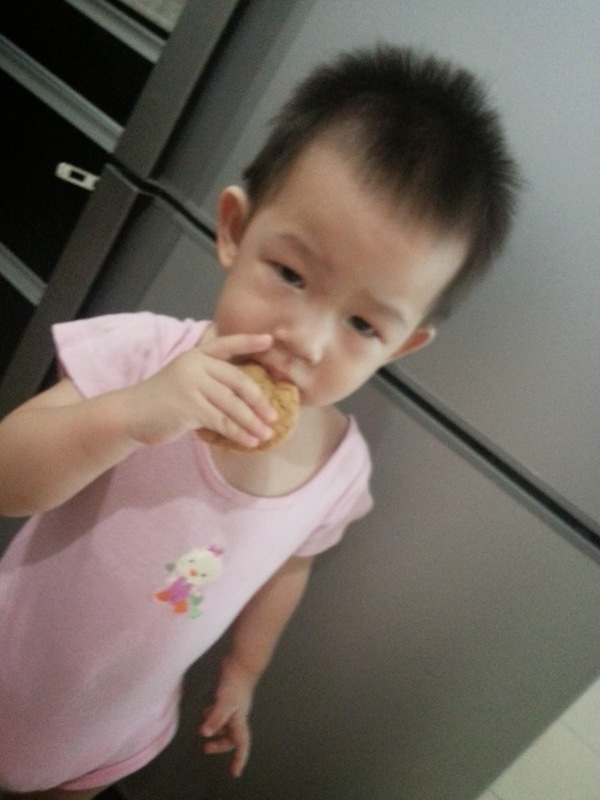 so meaning butter is a must for cookies ah?? you know what I mean right?? neh, like flourless cake like that..
Wah, kam jou ahh today? Cookies can be butterless also.. But with butter, more fragrant la..
cookies, cakes, biscuits, bread.. I love all these bakeries or any kind and flavor and pattern and fashion la, because I got sweet tooth, haha!! and I can actually wallop one whole packet of cookies or biscuits at one go leh, and the cakes and bread, one medium size loaf to me is "sap sap sui" only.. other people may the most eat 2-3 pieces only..
Eh, I can also wallop a big pack of cookies la.. I don't care if I develop rashes or sore throat the next day, I can just wallop.. "sik jor jing shuin".. Wait, where's your new post today? No post meh? Yesterday you no post wor.. Today sure got gak, hai mai? 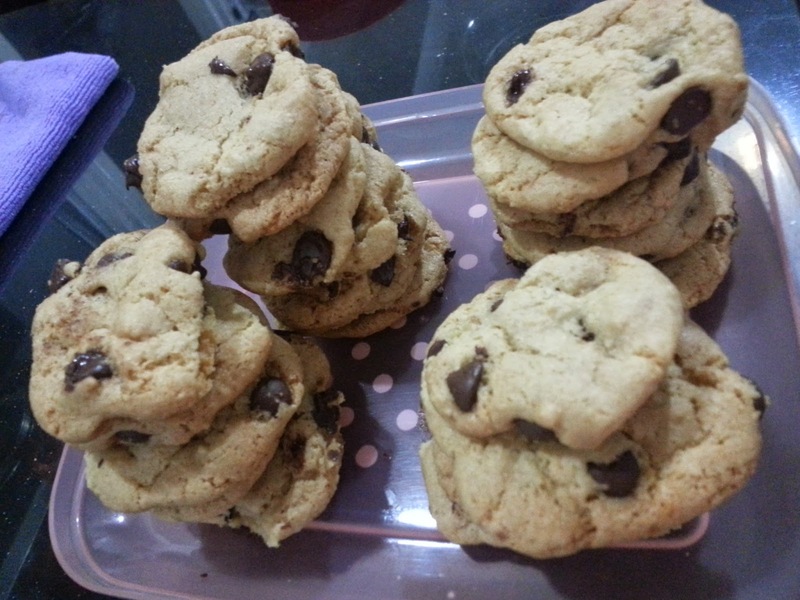 I like this type of chocolate chips cookies lah.. you know last time the Famous Amos cookies, very "hoong" one right?? I used to buy that if I feel rich lah, else just go and see see and smell the free smell also "gor yan" lor, haha!! and I actually worked with them in their Lot 10 outlet before.. more than 20 years ago la, of course they close down now.. that time just worked for 2 weeks during school holidays.. then everyday I make the cookies leh..
Wah, 20 yrs ago also you still remember ahh? Oh yes, I'm like you, sometimes in the shopping mall, I love to go nearby the stall just to smell the cookies.. No buy, coz if I buy, the boys would want it too, and I don't encourage them to eat those cookies, yit-hei la..
Half gone liao on the same day, not that I'm self-praising, but it was really good especially when they were still fresh from the oven..
you must think I so geng knows how to bake Famous Amos cookies!! "mmm hou soh" lah, of course they have secret recipe and the dough already premixed somewhere else.. so I just took out the box of dough, make them into the small dollops then put into the oven only.. all got SOP one.. but very tiring when need to press the dough and split them into little dollops leh.. one box dunno how many kg can make three four big trays one ga.. Ya la, I know la sayang.. They already have pre0mixed dough, you just scoop and bake only la.. Eh, can we scoop half of the bag and "curi" take home to bake? Will people find out? If me ahh, I think I will break the rules and "curi" a handful in every packet, put in my container, hide in my bag, then take home and bake myself leh..
aiyoh, why need to curi the dough?? just eat one two piece of the freshly baked ones when you are there lah!! but then hor, if you work there, then you see the cookies also jelak already, "mou wai hau" to curi also, haha!! Oh? Looks simple to make. Maybe I can try sometime. I'm not really a fan myself but my girl loves choc chip cookies very much. Yep Arthur, it's very simple, no butter.. Just cooking oil.. And please, don't use olive oil or your olive margerine melted and treat is as oil.. Use regular cooking oil do.. I use Mazola corn oil..
Again? Meaning this is for RG? You mean these cookies? No no... The secret admirer is not RG, haha..
Hi Louiz! Oh, can make cookies without butter? hee..hee.. I didn't know that. If they can still be crunchy and good to eat, why not? Chocolate chip cookies are still my favourite. G looks so cute in pink. I think in these photos he looks a bit like K.
Both Kz and G look alike, single eye lids.. They look like their father, not me, coz I have double lids, hehe.. Yep, butterless chocolate chip cookies.. I think you can be able to find many cookies recipes in the internet without butter.. Boys should look like father loh. Butterless ? Tasted good meh without butter ? Anyway , I think still fat leh but seems your kids love it. Of course with butter, they will be more fragrant.. But without the butter, still good leh, really ! You cookies look like Famous Amos!! You can name it Famous Ribbon's Cookies! I have tasted butterless cookies which is a recipe for health freaks. I noticed that without butter, your cookies shape looked better and not flat like being melted down by butter. Good try! I still put some baking soda into my dough, though I didn't mention.. Oh yes, not bragging, but it really tasted like FA cookies when I took it out from the oven.. But I have to admit, after 3 days, they turn soft.. So my advise is, make small batches and finish it on the same day if possible..
G is cute in pink romper. I also used to dress my Jay in girl's blouse. Pass down from the sister. Lol. I wish I have a secret admirer then it motivate me to bake! Kekeke. My hubby will kill me! You make it sound so easy to make! im actually just scared to start baking. lol. but this is good! 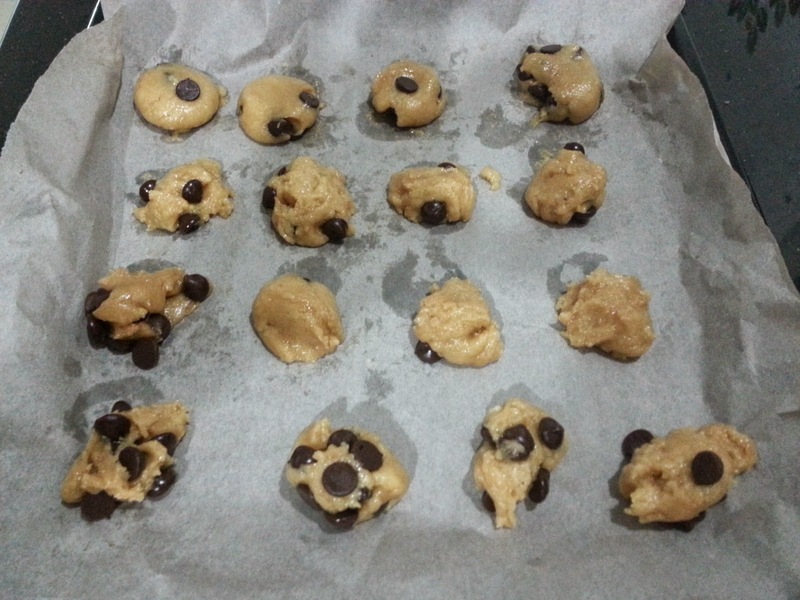 Cookies easier to make than cakes.. My opinion la.. Coz no need to use the mixer.. Everything just by hand.. I also want to be your secret admirer and get your tasty cookies. No butter also can. Soft already also I like. Your G looks like he likes the cookies very much. Mustbe really delicious! Haha, yeah, now macam-macam also can follow from the internet.. Butterless cookies or eggless cake.. I've seen sugarless eggless flourless cake timm! You can make yourself, all you need are the ingredients and an oven.. Can make in small batches to try first.. I LOVE butter though so I always put lots of butter into anything. I can even eat butter by itself. Haha! Coz last time our homestay didn't have a lot of condiments so there's this Kiwi guy who ate lots and lots of butter with the roasted chicken. This is salted butter and he'll buy his own and eat like 1/2 during dinner! I tried it once and it really mad everything better - not just the salt but the taste of the butter. Interesting! I would have thought the dough would be more oily and pliable without butter. Cheers for sharing! Yeah I remember reading it in one of your post - about that guy eating roast chicken with butter.. I love butter too but there was none in my fridge that day, so I just made do without it.. Yep like you, I can even eat butter on its own! Hubby doesn't know, shhh, hehe.. But I hinted to him before, he's not jealous, he somemore said "good la, at least you know you're still hot", kakakaka..
Butterless cookie? I like!! Less calories haha! But then again, with butter it's easier to make right? And also more fragrant like you said. Yup, you are so right, with butter, it's easier to make.. Without butter, it feels so dry and difficult, but still delicious..
Wei, looks so delicious to me ya, you so geng lo!! Where got geng.. Just stir everything together only. 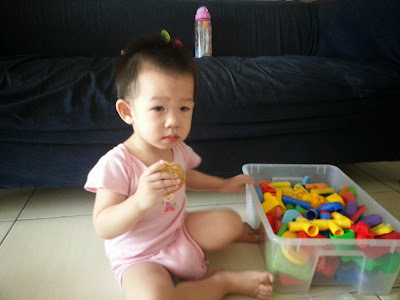 You can do it too..
Elo sweetie, I saw you got new post on chocolate chip cookies.. Will read it when I reach the office. Now getting ready the kids.. 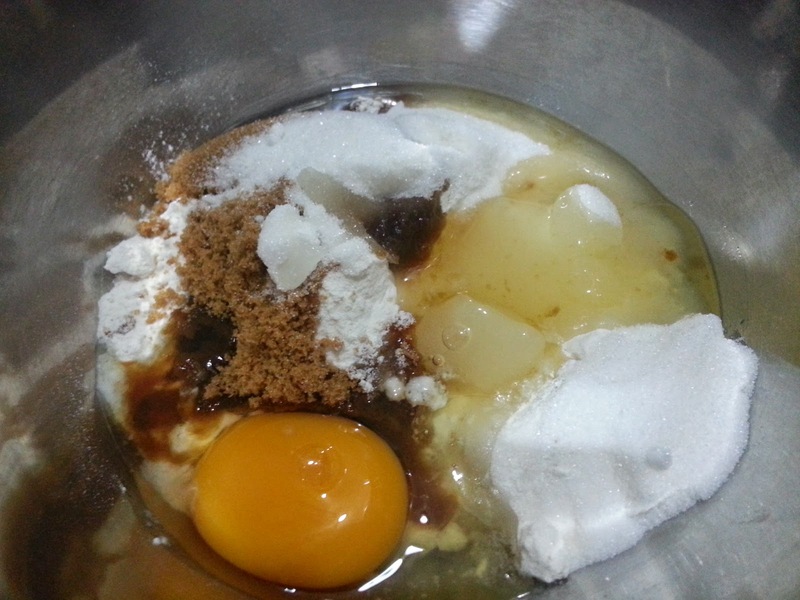 This recipe is indeed good, it is suitable to bake as Christmas cookies. So nice that your boy like them. 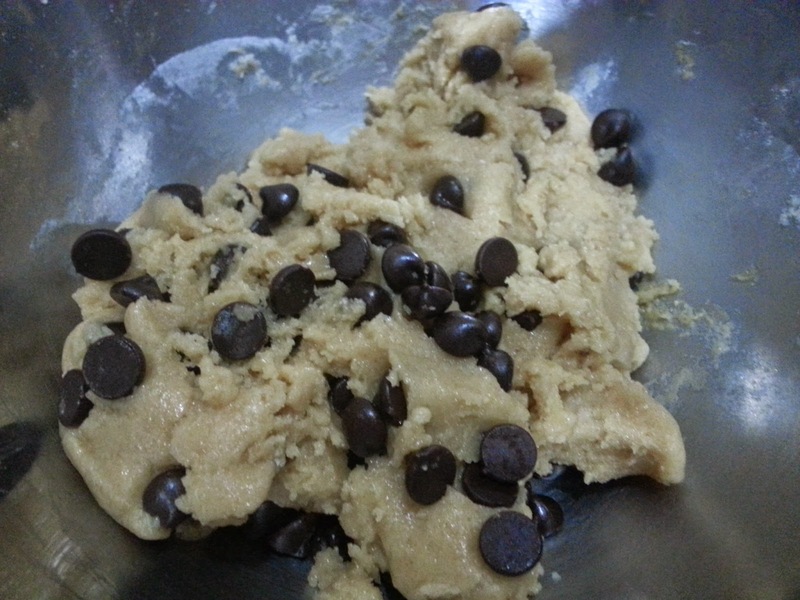 Looks yummy and easy to bake hor? I'll try one day when I am absolute free till nothing to do haha! And i am LOL at your boy wearing pink!! Princess, I always love the way you make baking sound so simple. I probably have to start using my oven with your simple recipes. Thanks for sharing. Lucky secret admirer of yours. haha..